Age is a funny thing isn’t it. Our lives divvied up into manageable sections – how long we’ve lived, how long – deduced hopefully from averages – we might expect to live yet. The maths of our being human. Numbers. Things we made up to make more sense of the world. How did we first come to count things – did some lovely fool in a cave fall in love with the stars and try to count them, and in quantifying them, own them? I turned 33 last week, and somewhere amid all the internal din, the silent fuss of getting older, the cell-rooted panic specific to women in their thirties that their Fallopian tubes might clamp shut before they get around to thinking about whether they want to use their lady bits as a hotel for foetuses, somewhere in the middle of all that, (and present-opening and beer and more food than is medically advised), I realised: BEING IN YOUR THIRTIES FRICKIN ROCKS. Obviously it has its setbacks. There’s a bit of prep that goes into a birthday in your thirties. You have to dye your hair the day before for a start (there’s nothing so tragic as people noticing your grey hairs as you blow out your candles). You have to consider everyone else’s lives in your celebrating; where is best to go for kids, what can everyone afford, who knows and likes whom, what happens if it rains, what happens if an asteroid in the park wipes out the scotch eggs, how much should you drink if you want to write that press release/spring-clean/still be alive the next day. It’s not simply a case of getting a bit older – there’s admin to fun in your thirties. I did a few things that made me feel ‘pretty darn rad’. I sacked off a casting for a part in something because I simply thought “No. I don’t want you and I shall not waste my time.” (definite progress from my 20s), I cut my own hair (a friend taught me the highly addictive ponytail technique and I have subsequently lost seven inches), and I got a new bike. My mummy got me one. It’s purple and awesome. Now, I haven’t had a bike since Helen Fulton borrowed mine in 1994 to go round to Leanne’s to have an argument and it got ‘stolen’ (Don’t ask. It’s still very raw.) so this wasn’t simply a case of replacing tired mechanics for new. This was serious stuff. This was childhood revisited. This was rebirth, with wheels. This was…clumsy, and not very pretty. 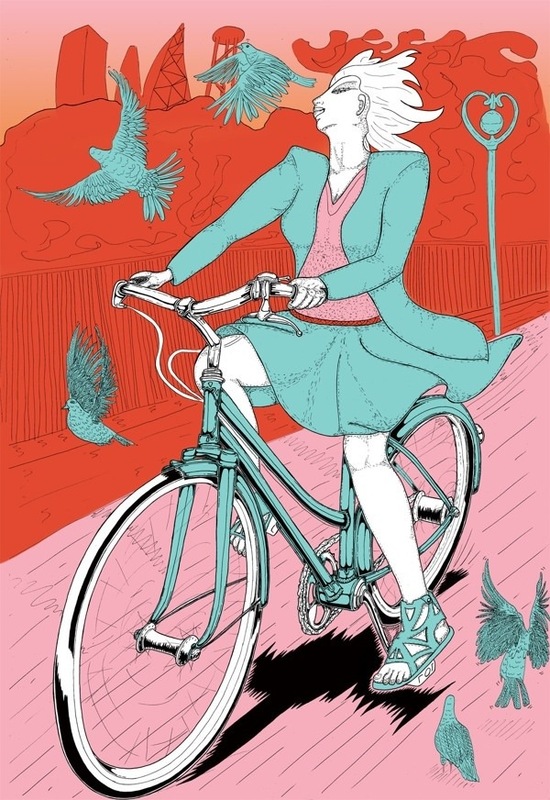 There is a blissful solitude in whizzing (okay – wobbling) along the pavement on a new bike, at any age. For a portion of those self-propelled moments you will always be the kid you were, set off down the road for the first time without the stabilisers on. You are alone in a scary beautiful world. Perhaps that is one of the first and truest existential moments we have. To feel it again after years of not having a bike is very strange. But I stayed upright. I did. I might have flashed my knickers and I might have looked a bit of a nob but for a few moments down the road I was all ages all at once, and I felt happy with where I’d been, where I was, and how I’d got there. My thirties. My lessons, my strength, my gathered love; my years cast up like stars above me. And then I went to the pub. By the way you can do it all over again in your forties. Now that I’m closer to fifty than forty, I am fully living up to my promise to never grow up. Bikes, trampolines,football and holding my eleven-year-old nephew down until he says ‘mercy, mercy Uncle Percy’ are some of my favourite pastimes. Hey Sadie, Hope it’s OK with you but I just sent a link to this post to Carnie’s Corner on Le Clown On Fire.